Anything can – and as we saw Sunday – will happen at Talladega. The new car provided exciting racing for the fans and good runs for some drivers, but headaches for others. Drivers like Juan Pablo Montoya and Travis Kvapil had surprisingly strong finishes while Matt Kenseth and Carl Edwards’ days ended early with tire problems, more evidence that the superspeedway is a crapshoot. With a wildcard like Talladega, it’s hard for some of the hotter drivers to stay out of trouble at risk of the “Big One.” Come in and see who survived and stayed on this week’s HOT list and who could really go for a good run at Richmond. *HOT* *Kyle Busch:* The younger Busch is beginning to look like he did at the start of the season. After finishes of 17th and 38th at the short tracks, Busch has three consecutive top 10s including a win this weekend at Talladega that almost got away. A near crash that displayed his amazing car control skills, a controversial pass below the yellow line and a last lap caution all went Kyle’s way in this week’s victory. Anything can – and as we saw Sunday – will happen at Talladega. The new car provided exciting racing for the fans and good runs for some drivers, but provided plenty of headaches for others. Wheelmen like Juan Pablo Montoya and Travis Kvapil had surprisingly strong finishes, while Matt Kenseth and Carl Edwards’ days ended early with tire problems, more evidence that the superspeedway is more of a crapshoot than anything else. With a wildcard like Talladega, it’s hard for some of the hotter drivers to stay out of trouble with the “Big One” lurking around every corner. With that in mind, come in and see who survived to stay on this week’s HOT list, as well as who could really go for a good run at Richmond this weekend. Kyle Busch: The younger Busch is beginning to look like he did at the start of the season. After finishes of 17th and 38th at the short tracks, Busch has three consecutive top 10s, including a win this weekend at Talladega that almost got away. A near crash that displayed his amazing car control skills, a controversial pass below the yellow line, and a last lap caution all went Kyle’s way in order for him to snag this week’s victory. Jeff Burton: Can 12th place be considered bad? Talladega hadn’t been kind to Burton, who had only finished better than 25th once there in his last five races; but the veteran improved on that history this week. Burton’s 12th place run is his worst since race two at California, and his second lowest finish of the year. Not bad, huh? Dale Earnhardt, Jr.: It was yet another top 10 this week for the leading Hendrick Motorsports driver, who came up short in his bid to end a winless streak that’s now reached 71 races. Junior is entering a stretch of the schedule where he has traditionally run well, but while his 10th place finish this week was not the victory many fans were expecting, he should be one of the favorites this weekend at Richmond; Junior has three wins and nine top 10s in his 17 starts at that track. Denny Hamlin: Hamlin was one of the most consistent Gibbs cars this weekend and had a shot for the win before the final caution came out. Finishing third, Hamlin now has four straight top 5s and five consecutive finishes of sixth or better. He’s moved from 15th in points to fourth over the past four weeks. 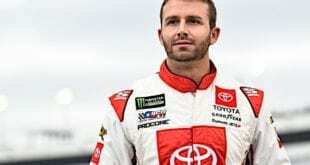 Clint Bowyer: You may not have heard his name called out much at Talladega, but Bowyer ran a conservative race that resulted in a respectable ninth place run. The Kansas native is on fire right now, scoring six straight top 10s that have jumped him from 24th in points to seventh. Juan Pablo Montoya: The Colombian nearly picked up his first Sprint Cup oval win and may just have pulled it off if it weren’t for a last lap caution. The second place run was Montoya’s only top 10 this year, but his consistency of top 20s in every race except for the opener has helped him sneak into 12th in points. David Ragan: Earlier this season, Ragan admitted more comfort in the car could lead to more success on the track. So far, he’s proven more than comfortable in his second year on the circuit; Ragan ran consistently up front, finishing fourth for his best run since Richmond last Fall. The Roush Fenway driver’s now finished in the top 15 in three of his last four starts. David Gilliland: Gilliland and teammate Travis Kvapil have shown signs of life lately for Yates Racing. Skeptics may say the two ran strong at Talladega because of the team’s superspeedway program, but Gilliland has three consecutive top 15s and four in the last five races. Reed Sorenson: Can things get any worse for Sorenson? After an accident and a 42nd place finish at Phoenix, the No. 41 had an engine failure on just lap 4 this week. Aside from a 24th at Texas three races ago, Sorenson has not finished better than 30th since Race 3. Matt Kenseth: Nobody could have expected Kenseth to struggle so much this season. He has yet to crack the top 10 in points, and with three finishes of 30th or worse in his last four races — including a blown tire early this weekend — he has dropped to 19th in the standings. Kurt Busch: One Busch may be running well, but this one isn’t. An accident in the final stages this weekend relegated him to 39th, Busch’s fourth straight race of 20th or worse. Despite sitting in the top 5 in points after two races, the No. 2 car now sits 20th.